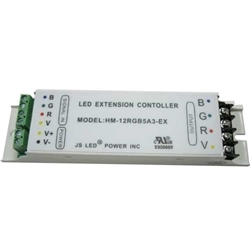 JS LED Power Amplification is used to expand LED controller output power unlimitedly, to control more LED lights, suitable to work with all our power output controllers.
? Three RGB channels, output current: 5A/channel x3.
? Accept PWM control method.
? Unlimited connection qty, unlimited power output expansion.
? Auto load protection?auto default recovery.
? RGB Controller is needed for operation.